The two gadget-makers are seeing sales swoon. It's a familiar pattern for tech products. It's hard out there for a device-maker. Two of the hottest IPOs in recent years, Fitbit (NYSE:FIT) and GoPro (NASDAQ:GPRO), hit the skids recently after delivering disappointing earnings reports -- both stocks have sunk to nearly all-time lows. Each one has shed more than 80% of its peak value. Earlier this month, Fitbit stunned the market when it said that revenue in the key holiday quarter would grow just 2% to 5%. Investors responded by sending the stock down 34%. GoPro stock had a similar experience, falling 17% over a three-day span that included its recent earnings report. In that update, the company again reported a sharp revenue drop -- sales fell 40% in the third quarter -- and said that revenue growth next year would come with an expected GAAP loss for 2017. 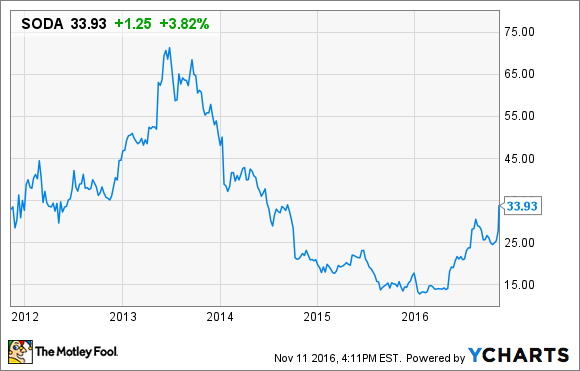 Longtime stock watchers shouldn't be surprised by such outcomes for these device-makers. Investors hungry for the next big thing have a long-standing tendency to pump up the valuations of stocks like Fitbit and GoPro before sales growth flags and the stocks tumble. These are tough businesses to compete in. It's not easy to persuade millions of consumers of the need for something new like an activity tracker or an action camera. And persuading them once is not enough: Wall Street demands growth above all else. These companies need consumers to upgrade their devices regularly, or buy the latest line of whatever they're selling. This phenomenon has played out with plenty of other stocks before. A few years ago 3D-printer stocks were all the rage. The market bid up shares of companies like 3D Systems (NYSE:DDD) and Stratasys (NASDAQ:SSYS) in the hopes that 3D printers would become household products in the way that regular printers are, but that never materialized and the stocks crashed. This type of pattern can be seen outside of technology as well. Following its 2011 IPO, DIY sodamaker SodaStream International (NASDAQ:SODA) surged through 2013 as the company made a big push for the U.S. market. However, its sales growth sputtered shortly after, and the company was forced to rebrand itself as a sparkling water company, which has resulted in a modest rebound this year. In addition to the problems endemic to fad stocks, innovators like Fitbit and GoPro face another risk. Tech gadgets like these are easily disrupted by newer devices from rivals. For what now seems like a brief moment in history, Blackberry (NYSE:BB) dominated the smartphone market. Then Apple (NASDAQ:AAPL) launched the iPhone and quickly took over the burgeoning industry. Today, Blackberry shares are worth just about 5% of what they were at their peak before the recession. Similarly, Garmin (NASDAQ:GRMN) once reigned over the GPS market before the proliferation of smartphones made a stand-alone navigator unnecessary. Today, Garmin's business revolves mostly around more specialized devices for fitness, aviation, and marine use. Like Garmin and Blackberry, Fitbit and GoPro are squarely in the middle of Apple's warpath. Smartphones now feature pedometers and other fitness-related features, and the Apple Watch and Fitbit Blaze are both targeting the same smartwatch customer. Similarly, Apple's new iPhone 7 included a significant upgrade to the camera, reducing the necessity of a GoPro. But even Apple's experience offers a cautionary tale for companies like GoPro and Fitbit. Apple is the king of device-makers and the most valuable company in the country, but since releasing the iPhone it has struggled to create another device with lasting relevance. The iPad was hailed as revolutionary when it was first released in 2010, but sales of the trademark tablet have fallen for several years, disrupted in part by larger-screen smartphones such as the iPhone 6 plus and the Samsung Galaxy Note. It's still early for the Apple Watch, but its sales have been underwhelming, and the company has struggled to penetrate other markets such as TV. 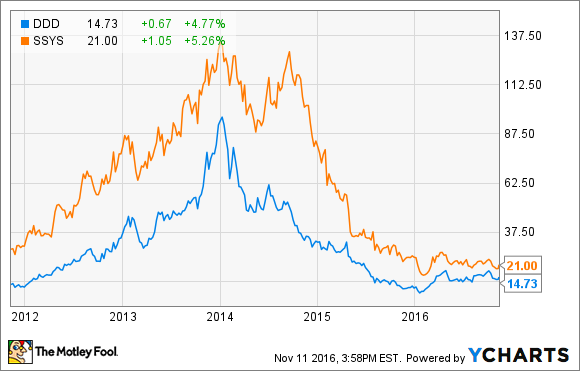 For Fitbit and GoPro investors, the lessons seem clear. While the stocks may rebound from their current lows, they're unlikely to hit the euphoric highs that followed their IPOs. Breakthrough products like the iPhone don't come around often, and the experiences of other device makers show that once revenue growth slows it tends to stay that way. For Fitbit and GoPro, things are likely to get worse before they get better.